Alice Returns Through The Looking-Glass, is an original novel written by Zizzi Bonah, published by She And The Cat’s Mother. It has been adapted by Zizzi into a Musical Screenplay and Musical Stageplay, script editor; Gwen Hullah. Zizzi dedicates her story to children of all ages who love the Alice created by Lewis Carroll. Please note: all characters in Alice Returns Through The Looking-Glass, are the creation of Zizzi Bonah, (with exception to the character of Alice, who was created by Lewis Carroll). 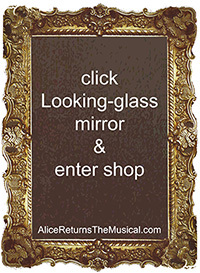 Alice quote: “There ought to be a book written about me, that there ought! And when I grow up, I’ll write one –” from Alice’s Adventures in Wonderland by Lewis Carroll.